A particularly high incidence of hepatitis has been reported among Tibetan exiles. Credit: Katie Lin/IPS. DHARAMSALA, India, Oct 19 2012 (IPS) - As the Central Tibetan Administration (CTA) works to address some of its more immediate political problems, long-term public health issues have emerged, including high rates of hepatitis B among the exiled community. 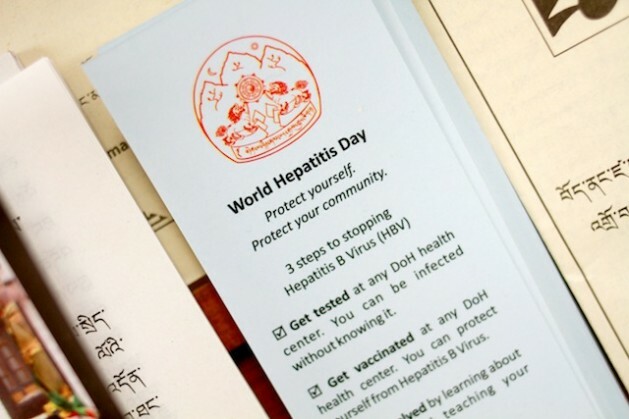 But this year, the health department of the CTA, which is based in Dharamsala in northern India, took steps to recognise World Hepatitis Day for the first time on Jul. 28, showing their commitment to reduce these rates. “We instructed all our health centres to observe this day and to spread awareness about hepatitis B,” minister for health Dr Tsering Wangchuk tells IPS. Since 2002, the health department has been immunizing all Tibetan children under five, and offering free screening for mothers-to-be. But despite efforts to tackle this widespread viral disease, its prevalence remains high. While there is no precise data available relating to hepatitis B among the Tibetan population, Dr Kunchok Dorjee, a general practitioner and public health specialist at Delek Hospital in Dharamsala, supports the health department’s estimates that the prevalence remains above 8 percent. The World Health Organisation (WHO) defines as “high” the prevalence of a disease in more than 8 percent of the population, “intermediate” as 2-8 percent, and “low” as less than 2 percent. According to Kunchok, there are several factors contributing to this high prevalence, including the political situation in China. Since 1959, more than 128,000 Tibetans have fled the country due to the repressive approach of the Chinese government in its control over this region. “In Tibet, it’s hard to intervene,” he says. “We were not able to gear up a vaccination campaign, because over the last several decades, Tibet has gone through a very tough time, and healthcare is not the first priority. And while the government-in-exile attempts to combat rates of infection through vaccination campaigns and health education programmes, there remain many misconceptions about the virus, especially in relation to its transmission. Similar to the human immunodeficiency virus (HIV), hepatitis B is transmitted through contact with blood or other bodily fluids of an infected person. “When people learn about hepatitis B, there is discomfort, especially knowing that it is sexually transmitted,” Kunchok says. He also notes that transmission through casual contact is actually one of the most common methods of transmission of hepatitis B in endemic regions, and identifies the most vulnerable groups among the Tibetan community as schoolchildren and those living in crowded conditions – including monks and nuns, who traditionally abstain from sexual activity. Another contributing factor to the high rates of hepatitis B among this group is the use of shared razors, a practice which Kunchok says is significantly less common now, as awareness about the virus has spread. While the Tibetan government-in-exile continues to make a concerted effort to control the spread of hepatitis B and Kunchok has seen a noticeable improvement in rates among the exile community over the past few years, there are many battles ahead. For one, the vaccine is only 95 percent effective against a virus that is 50 to 100 times more infectious than HIV and that is uniquely able to survive outside of the body for up to seven days. And in a culture where shared living is common and unvaccinated exiles continue to arrive – some as undiagnosed carriers of the virus – the chances of infection are considerably greater. “Right now, hepatitis B is a public health problem and, I believe that for any public (health) problem, the solution is public health awareness,” Kunchok explains. According to Kunchok, other initiatives that should be shouldered by the Tibetan government-in-exile include follow-up care services and more frequent awareness campaigns. But for the moment, the health department is focused on addressing the lack of statistics and studies pertaining to hepatitis B among the Tibetan population. The WHO estimates that more than 2 billion people worldwide have been infected with the virus. Of these, approximately 360 million are chronically infected and become carriers of hepatitis B, leaving them susceptible to cirrhosis, or scarring, and cancer of the liver. Three quarters of the world’s population live in areas where there are high levels of infection.